The much anticipated Battle of Waterloo had a different vibe to it this year, especially for those who have paid attention to the rise of the Waterloo Warriors. That different vibe led to a different result as the Warriors broke Laurier’s 15 game win streak against them in a nail-biting 34-32 win. Led by Tre Ford, second-year quarterback, and Tyler Ternowski, star receiver, the Warriors have built a very dangerous and dynamic offence, and a consistently improving defence. While this may have surprised many, it did not surprise Laurier coach Michael Faulds. “I don’t think anything surprised us. We knew they were improving each and every week defensively and we knew offensively, their quarterback is super talented and they’ve got a good receiving core. We knew it was going to be a hard fought game,” Faulds said. After feeling each other out for the first couple of drives, Waterloo would break the game open first on a 49-yard pass from Tre Ford to fullback Kevin Boismier. From that point on, it would become a back-and-forth shootout until the end of the first half, with the score being 22-17 for the Golden Hawks. There was no encore in the third quarter to the show that was put on in the first half though. Defence became the name of the game, especially for Laurier as they held the Warriors scoreless and went up 29-17. While they managed to get past half field, the Golden Hawks offence fell short in capitalizing on their opportunities and were not able to be their dominant selves in the clutch. The fourth quarter is where everything changed. Starting out with a drive where the Warriors scored a field goal to only be answered by Laurier with one to make it 32-20, they would flip the switch. Led by Tre Ford, the Warriors would go on a 75-yard touchdown drive with seven minutes left to make it 32-27, making the game close again after it seemed Laurier would run with it. “It’s not about stopping them. You try at times to maybe limit how much they get into free space,” Faulds said, in regards to the Warriors dynamic duo. With 2:37 left in the game, the Tre Ford to Tyler Ternowski connection would hit the jackpot in free space once again. Ford connected with Ternowski for an 88-yard touchdown down the middle on an intermediate route, the only play of the drive to stun the Laurier faithful making it 34-32. 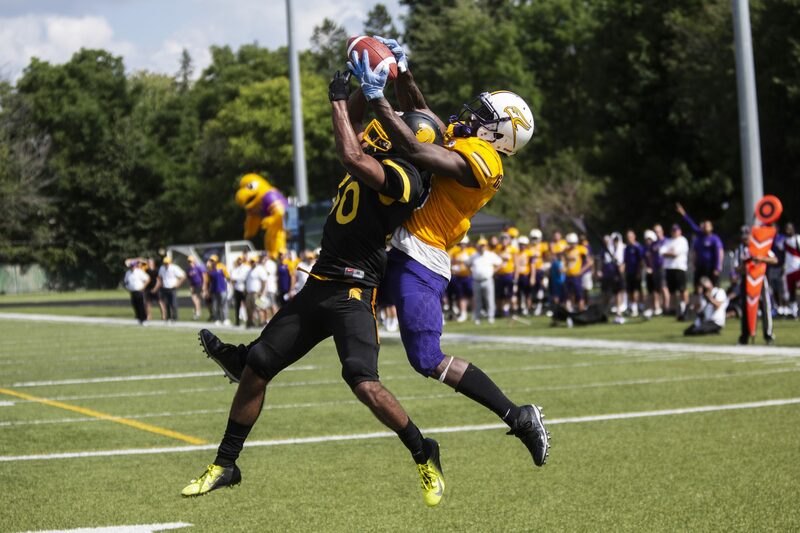 With the game on the line, the ball would be in Tristan Arndt’s hands to lead the Golden Hawks offense to victory alongside star receiver Kurleigh Gittens Jr. & co., who had a dominant performance for much of the day. After being stopped by Waterloo’s defence at their own 49-yard line on the first drive, the defence would get the Laurier offence another opportunity with 43 seconds left at their own 17-yard line. “We knew we needed three points. The first drive, obviously we’re throwing it. We’re not opposed to running it but we knew we had to get chunks of yardage,” coach Faulds said. With the Golden Hawks having McMaster up next, coach Faulds was still optimistic about how his team will fare as the season progresses.